Provides a source of information for customer and vendor orders (our Orders and Purchase Order applications); receives inventory directly and as processed from Purchase Orders; maintains on-hand quantities; reports all inventory transactions. 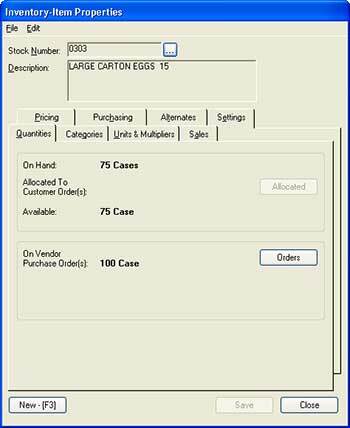 Inventory reporting, sorted and selected by several criteria (class, location, vendor, and other codes) . . . This is the initial window of our Inventory module. It's a peek into the database of transactions that have changed your stock. It defaults to changes made over the most recent 24 hours, but you can change that. You can browse through transactions for one item, a range of dates, just sales or receipts (or other types). Since any change to your inventory must be the result of some transaction, here you can see exactly why your present counts are what they are. All the inventory information is available from one window. Just press F7 (or select File>Inventory). This is a typical Windows "properties" window, and each tab is a collection of related settings or values. We can configure the item description to different lengths in the database. Long descriptions will "wrap" to fit the space available on the screen or printed report or document; or you can press Ctrl+Enter to insert "hard-returns" to force new lines when printing or displaying. Click here for more detailed descriptions of the inventory-item properties information several of our applications use.